The first and the last, who once died but became to life, says this : "I know your tribulation and poverty, but you are rich. I know the slander of those who claim to be Jews and are not, but rather are members of the assembly of Satan. Do not be afraid of anything that you are going to suffer. Indeed, the devil will throw some of you into prison, that you may be tested, and you will face an ordeal for ten days. Remain faithful until death, and I will give you the crown of life. "Whoever has ears ought to hear what the Spirit says to the churches. The victor shall not be harmed by the second death." 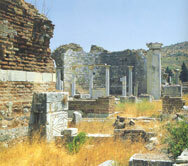 The church in Smyrna (2:8-11) had experienced great pressure from the Jewish authorities, called the synagogue of Satan. No archaeological evidence exists today for such a synagogue. It had closed its doors to Christians, and its leaders were inciting the Roman authorities to persecute the church. The Jews later had a similar role in the martyrdom of the bishop of Smyrna, Polycarp. The crown of life is a possible allusion to the acropolis Mount Pagus that looms over the city. Such ancient writers as Aristides describes it as Smyrna's crown. Whatever temporal crown the citizens of Smyrna enjoyed, the believers were guaranteed an eternal crown. They were also promised exemption from the second death. There existed in the ancient world a connection between death and Smyrna. Its name is identical to the Greek word for the sweet-smelling spice in which dead bodies were wrapped (e. g., Jesus; John 19:39). A number of mourning myths became associated with Smyrna, particularly that of Niobe whose tear-stained face was thought to be etched in the marble of nearby Mount Sipylus.